Catania Fontanarossa Airport is the best way to reach Acireale. This is served by direct international flights, or by connecting flights from other airports, such as Rome or Milan. Esee organisation provides a free shuttle service from Catania Fontanarossa Airport to Acireale and return, according to the following timetable. The rental service with driver (NCC) and TAXI are the fastest and most comfortable routes. The Alibus ATM shuttle bus service connects Catania Fontanarossa Airport to the Catania center. The Alibus ATM shuttle bus service runs every 20 minutes, from 5.00 to 24.00 towards Catania center. You must get off at Catania Central Train Station and take a train or an AST bus line towards Acireale. The travel by train from Catania central train station to Acireale takes approximately 17 minutes. The ticket can be purchased online or at the train station. Time schedules and fares are available on the Trenitalia website. 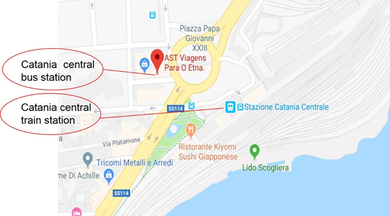 AST offers a direct connection from Catania central bus station (close to the train station) to Acireale. The municipality of Acireale runs along the A18 motorway and is easily accessible from the city of Catania (just 20 km) or from Messina (70 km). Greater is the distance with the cities of Palermo (about 208 km) and Agrigento (about 180 km). Buses from Catania airport to Acireale. Buses from Catania to Acireale.